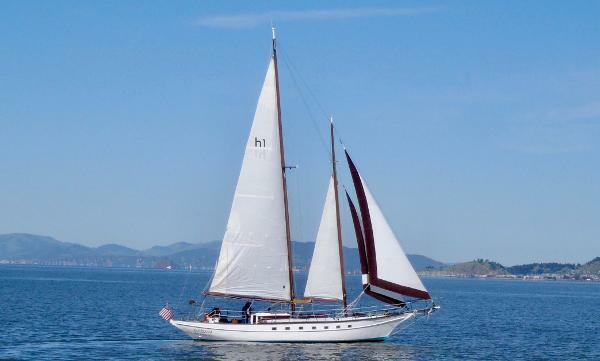 When Nathanael Herreshoff designed the original GLORIANA for J.P. Morgan as an ocean racer, he adopted lines from Tancook Whaler fishing schooners designed to win the race back to harbor in the nasty waters off Newfoundland. When Sidney Dewolf Herreshoff was commissioned to build a schooner in 1942, he adapted his father's hull lines for a second GLORIANA built to the 12 meter rule, making her a double ender with a shorter, six foot bowsprit. 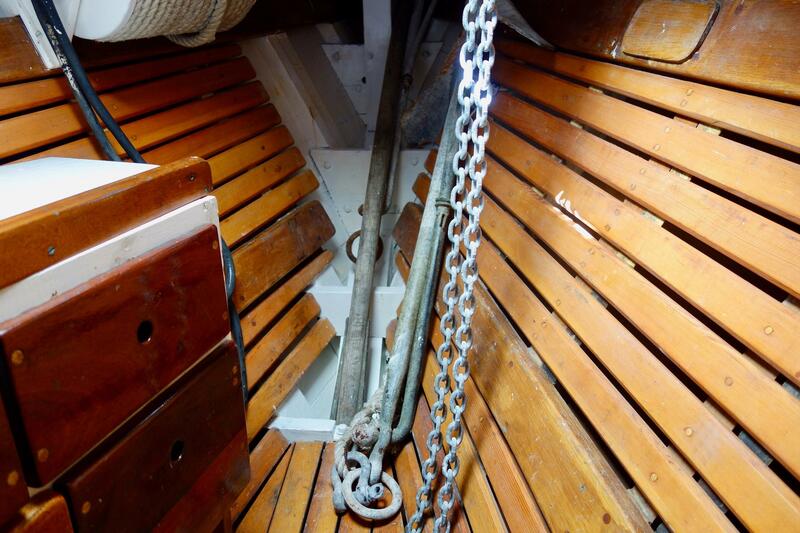 Her document lists her as 39.1 ft, but the boatyard measures her from clipper bow to stern at 42'. Those design roots give this GLORIANA her speed and drive through the water, and the foundation for great sailing experiences. 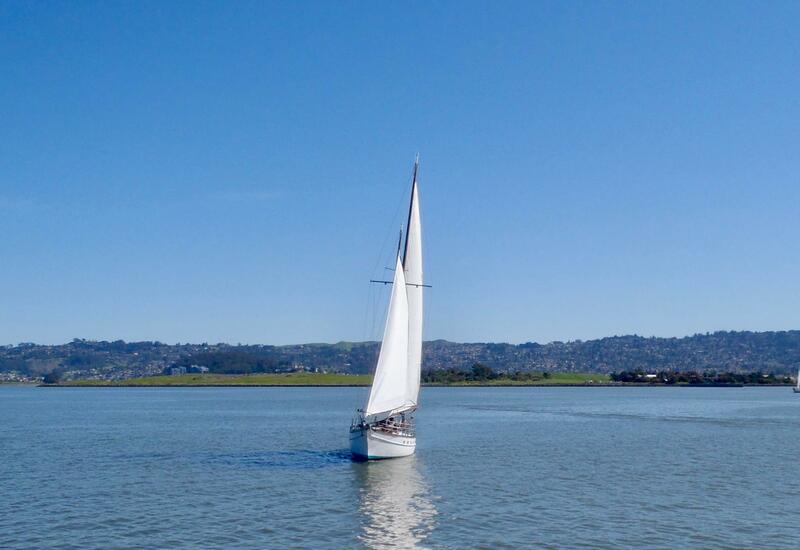 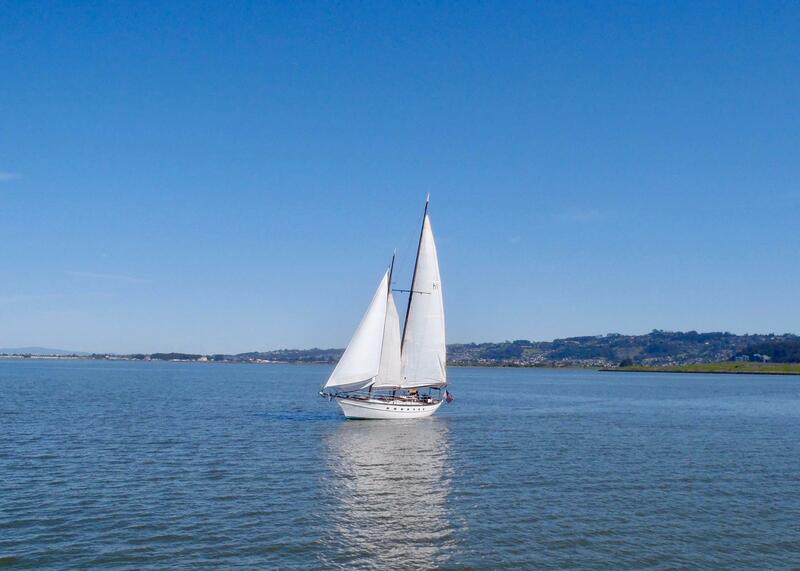 When beam reaching in the slot on San Francisco Bay, something about her hull shape lets her accelerate through the water at greater than hull speed. 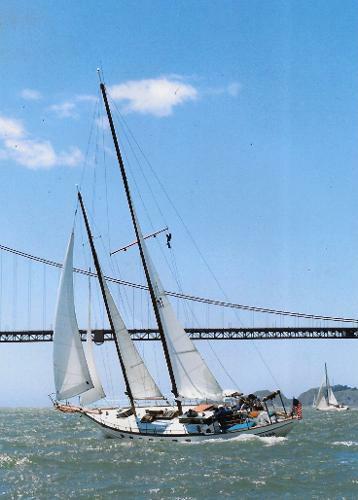 During the Master Mariner's race in 1988, she was clocked at 14.1 knots by Danny Wilson across the finish line in a low gale. "Feeling the wind's power in all four sails, sensing the water flow over hull and rudder through the wooden wheel spoke, slicing the schooner through waves and wakes, brings joy. 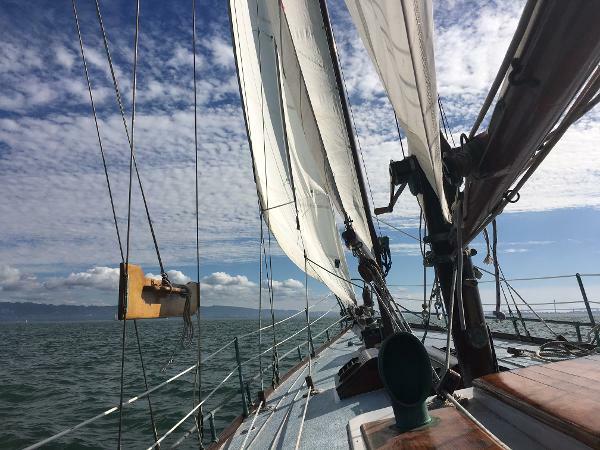 Knowing you're ready to coax movement from light zephyrs or handle gales by furling the jib or the staysail from the cockpit and taking in a reef or two brings confidence. 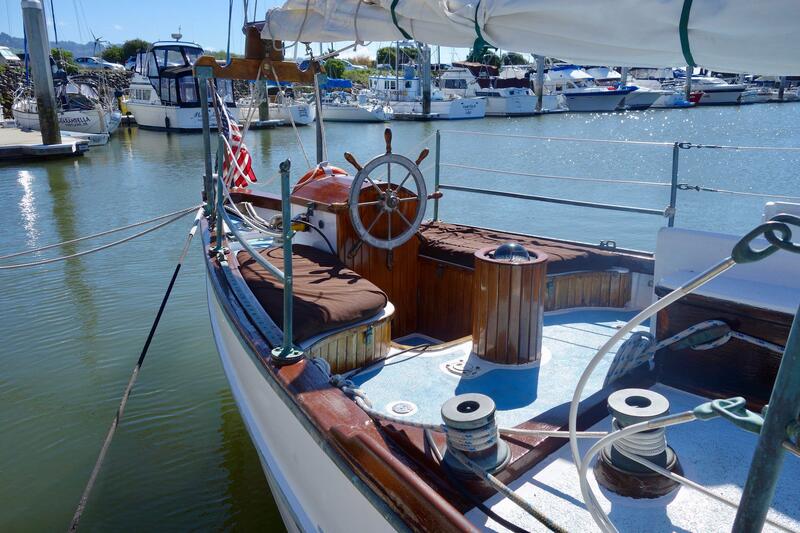 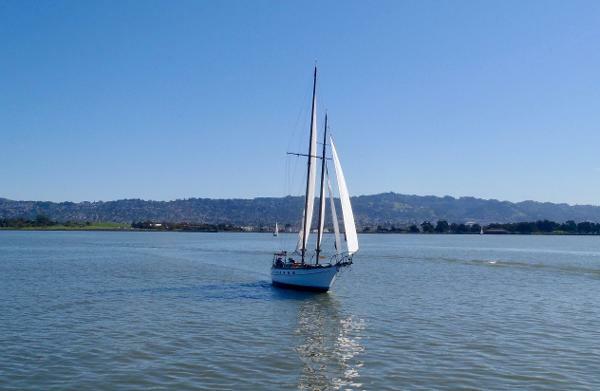 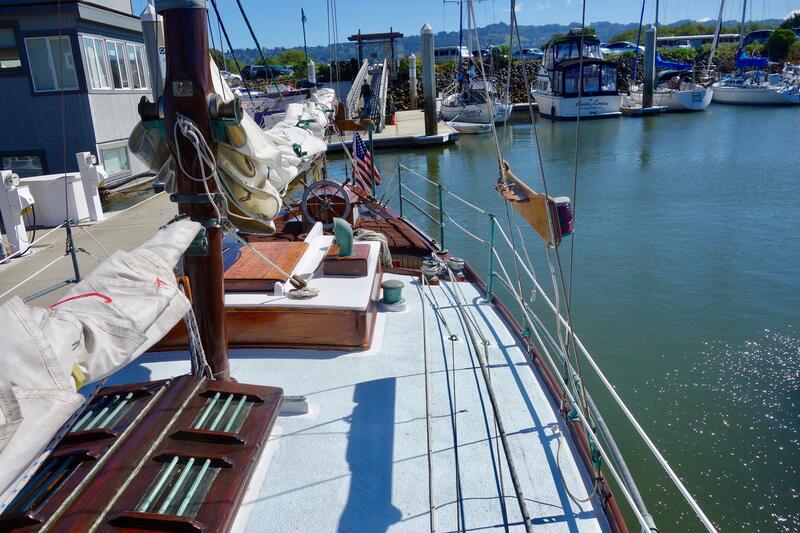 Sailing this schooner is empowering as well as just plain fun!" 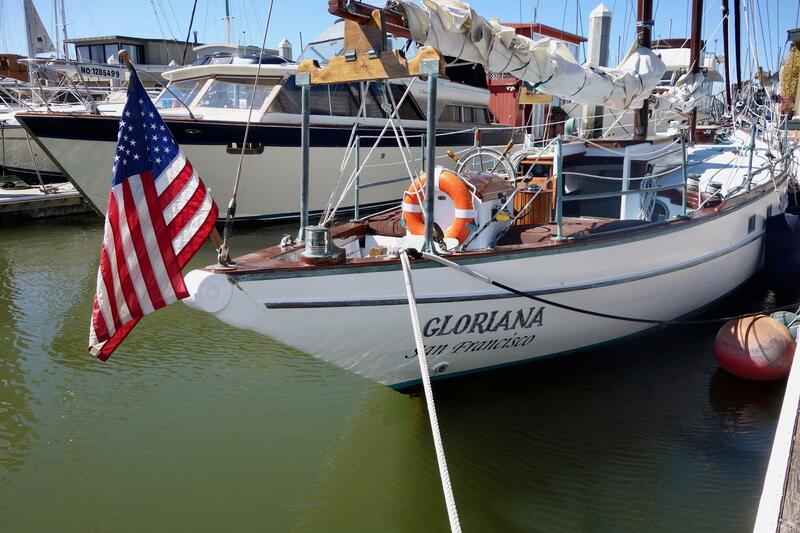 The Herreshoff yard team members who'd moved across the Bay to Tiverton, R.I laid Gloriana's keel in 1942. 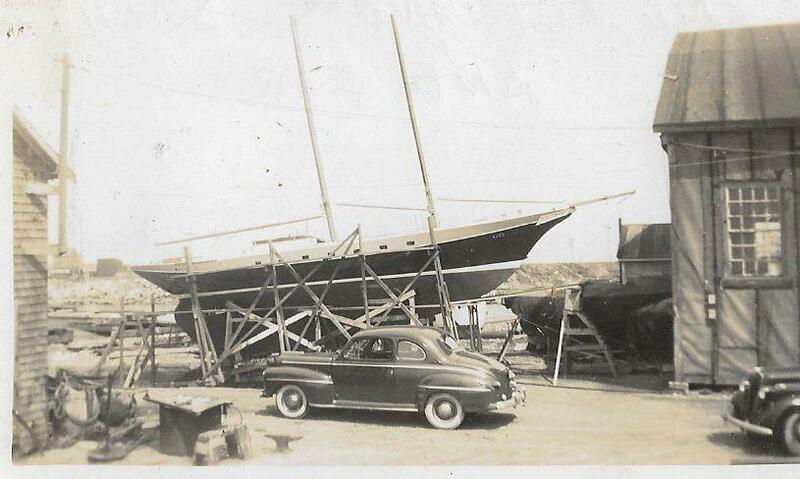 But, wartime material and labor shortages meant she finally was launched in 1949, as seen in the image of her on the ways, with the first owner, Dr. Strong's car parked in front. Mark Schimmelman bought Gloriana from a boatyard in Panama City, Florida, in 1987. 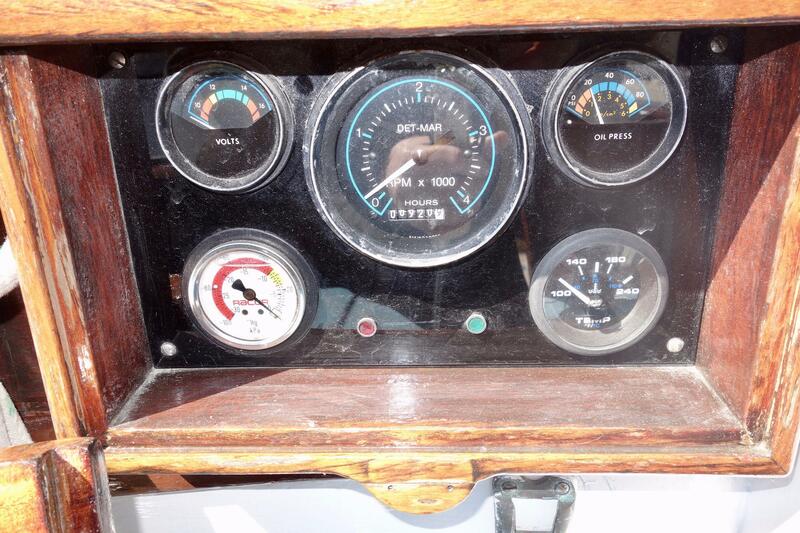 That yard installed a new Perkins 4-108 engine, which now has 919.6 hours on it and runs well. Mark had Gloriana trucked to Oakland, CA for launch. 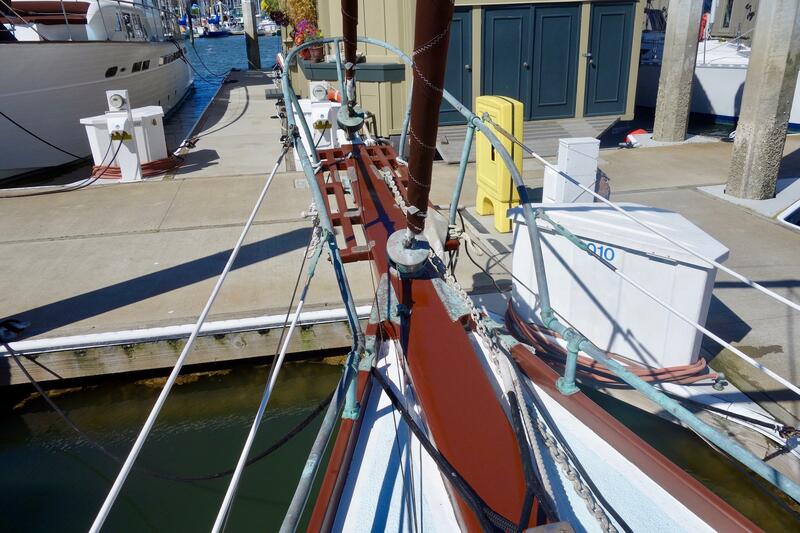 Dreaming of ocean cruising the schooner, Mark and Nancy stiffened the existing structure by adding full length frames, and some additional floor timbers. 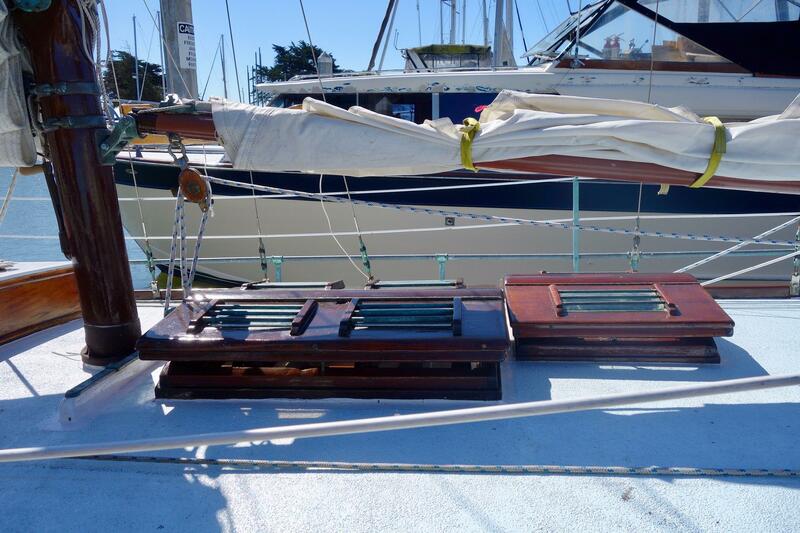 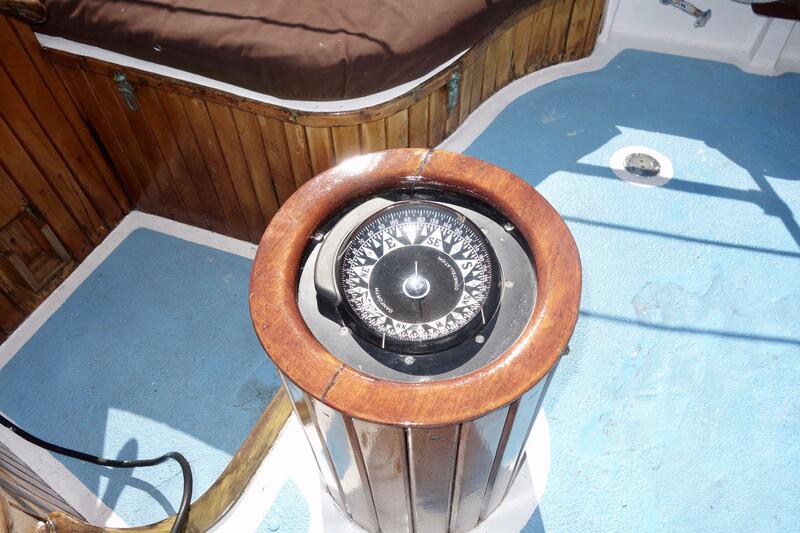 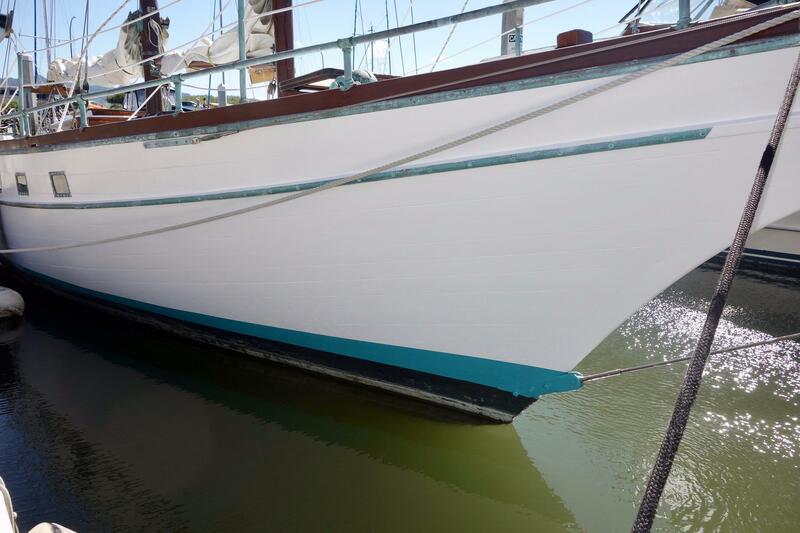 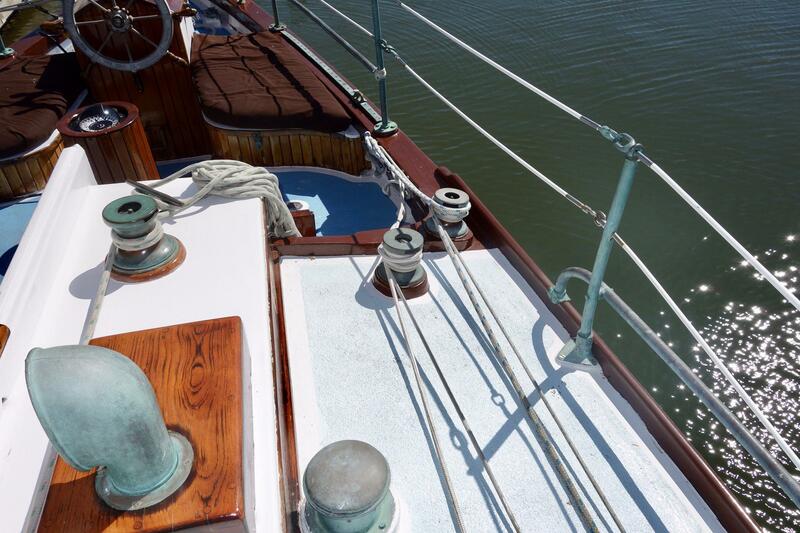 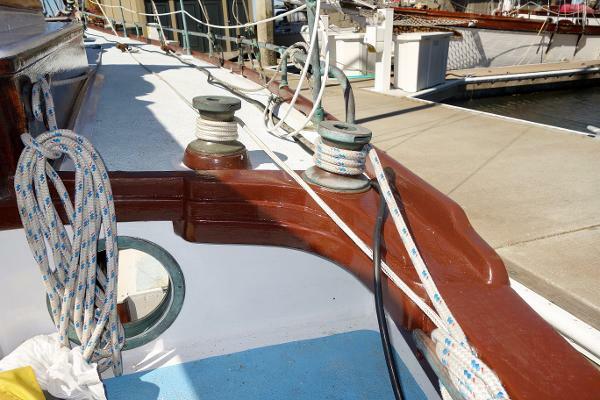 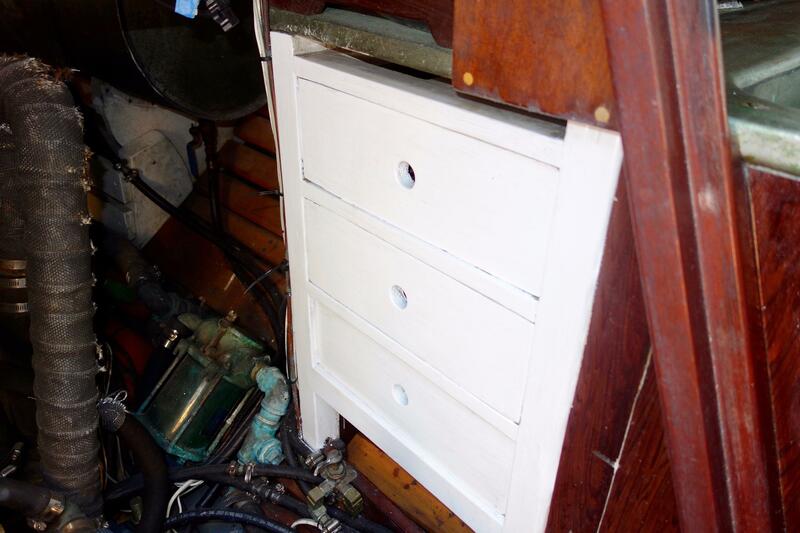 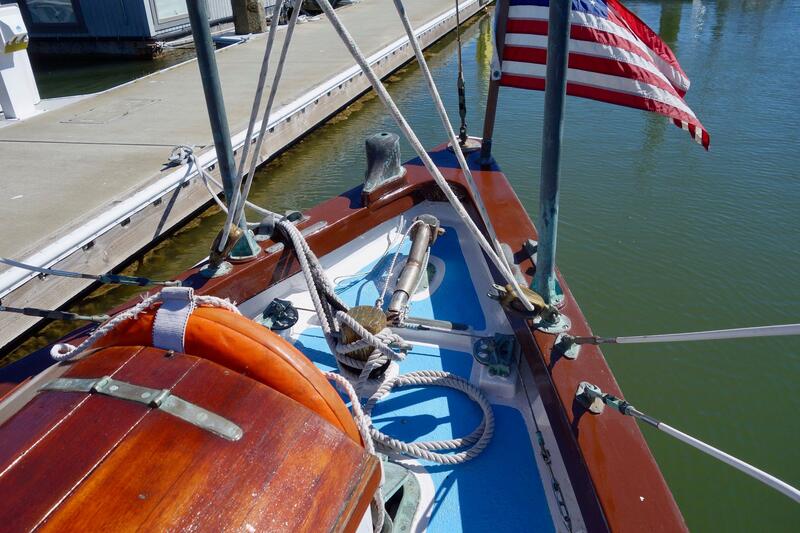 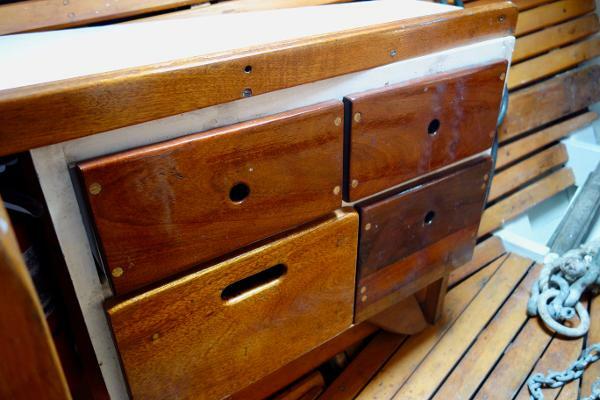 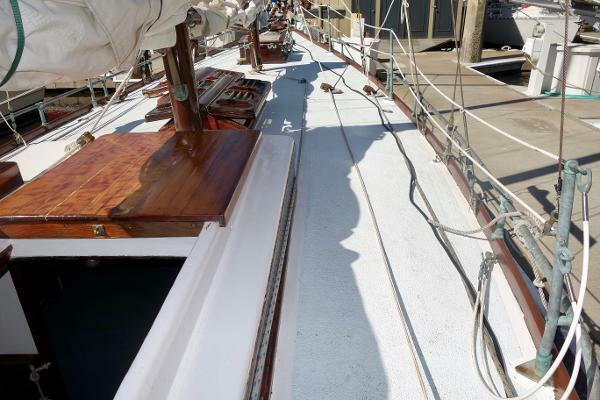 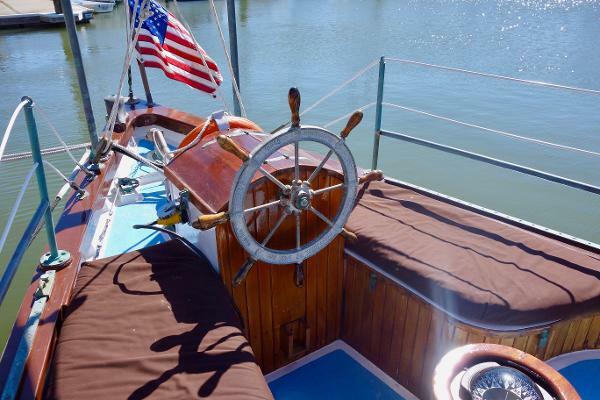 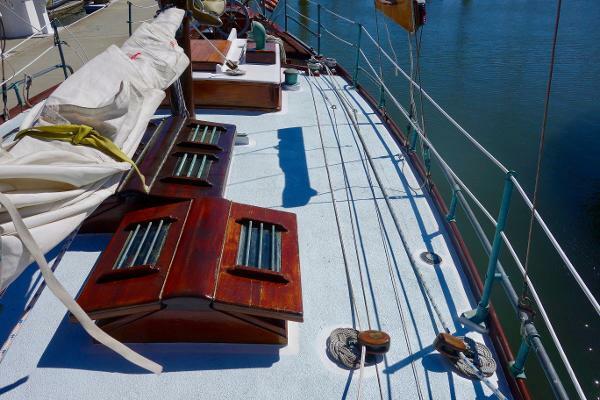 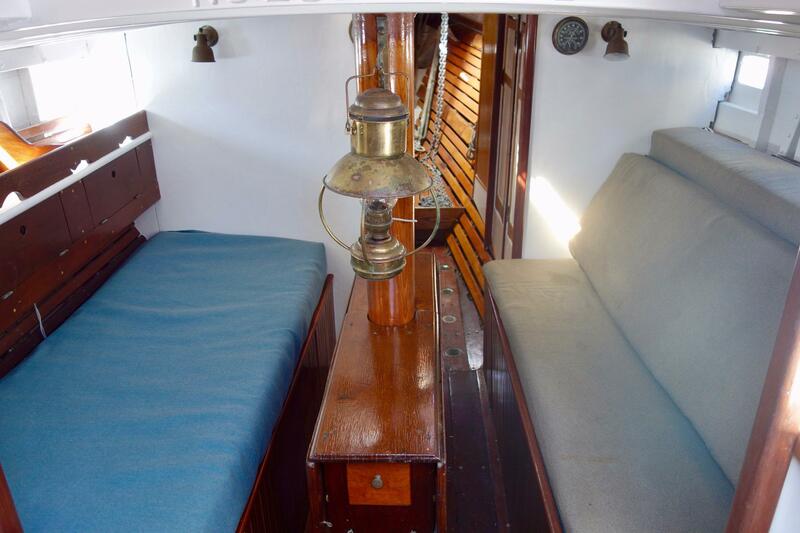 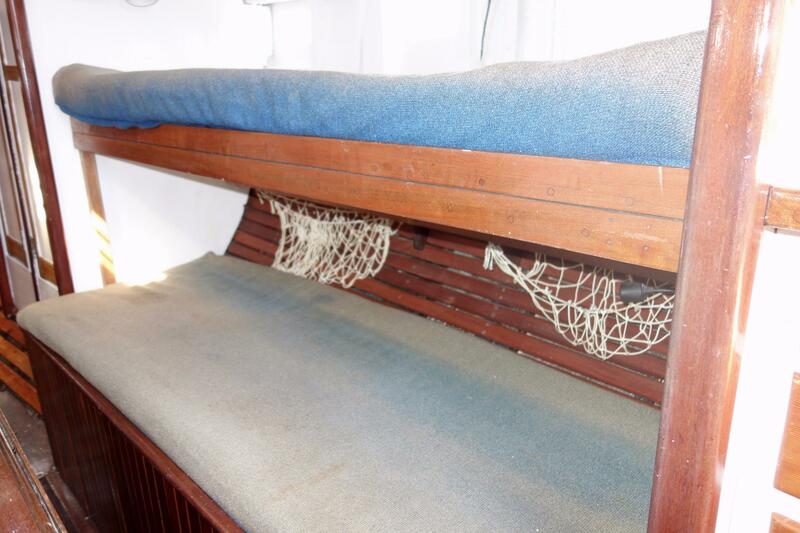 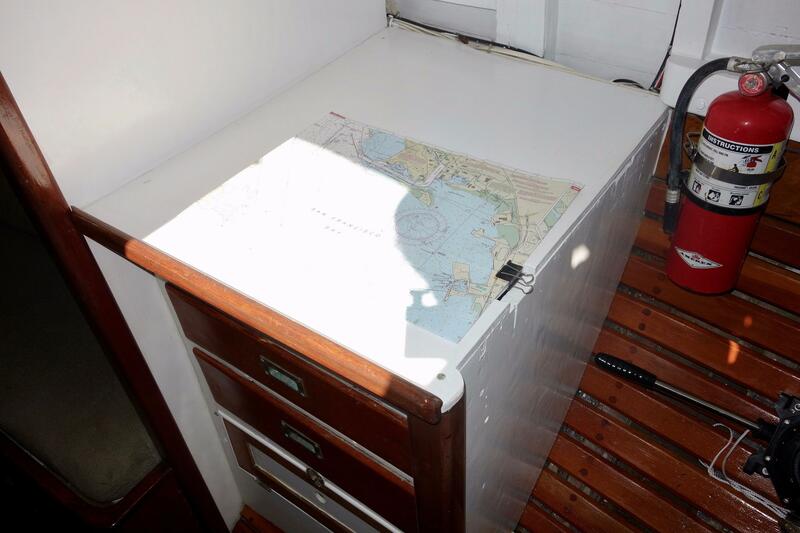 They installed epoxy clad keelbolts, four laminated oak full length bilge stringers, fastened all the planks into the sister frames, completely re-caulked the seams, and re-painted. Mark and Nancy were married on the schooner's deck in 1990 in the midst of this process. 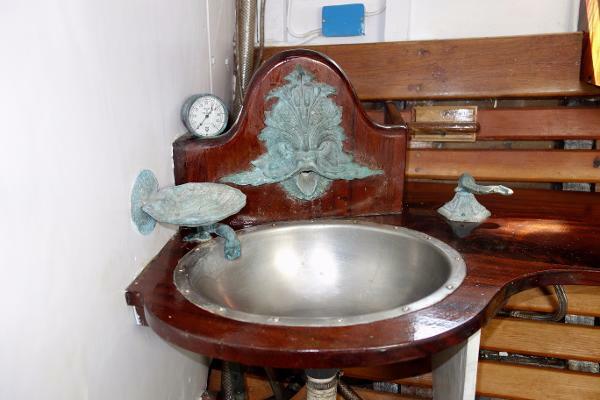 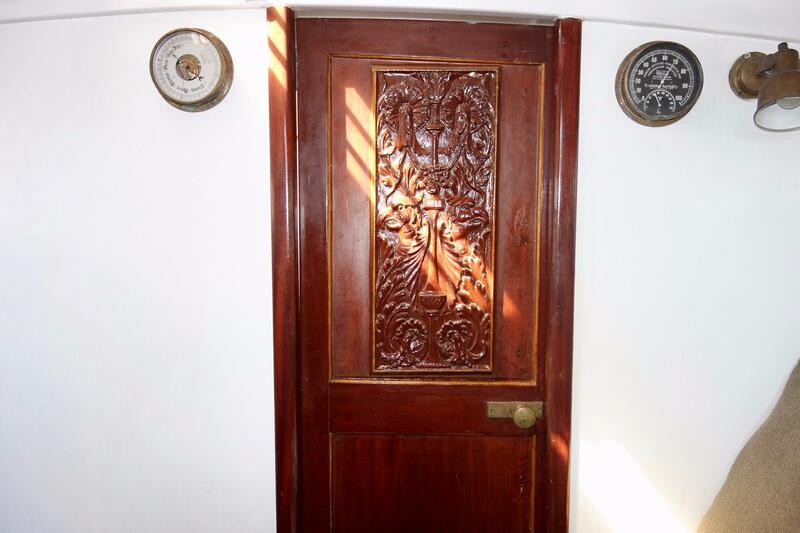 Gloriana features an antique bronze Kraken's head as the head water faucet, and a carved wood panel from an old sunken ship on the saloon door. 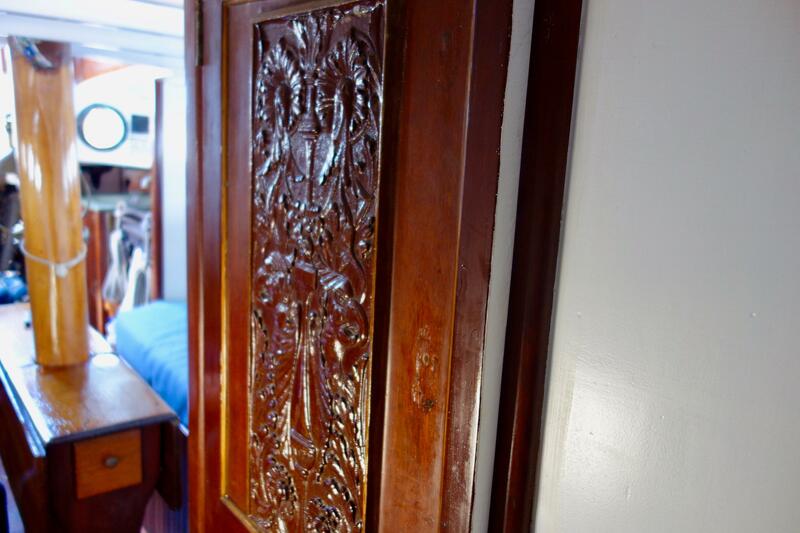 Nancy made a head cabinet door from mahogany wormwood. 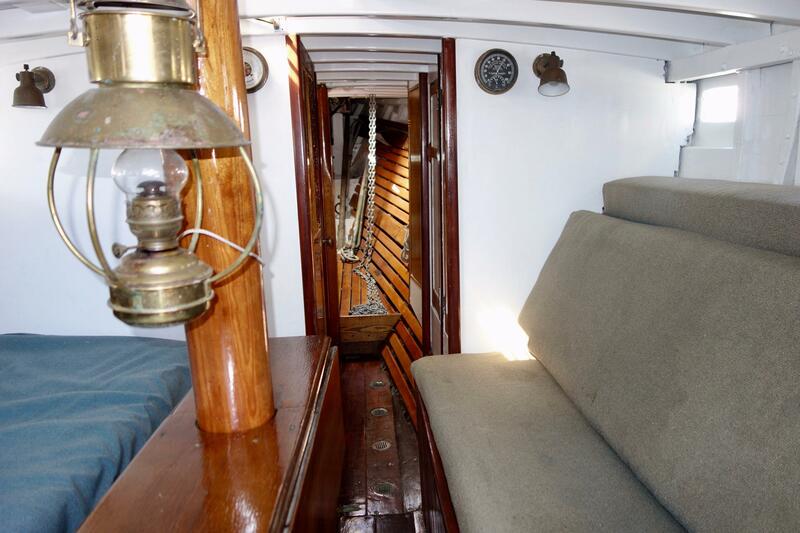 The couple rebuilt the interior, sealing each bulkhead before repainting, and crafting cabinets in the saloon from recycled redwood. 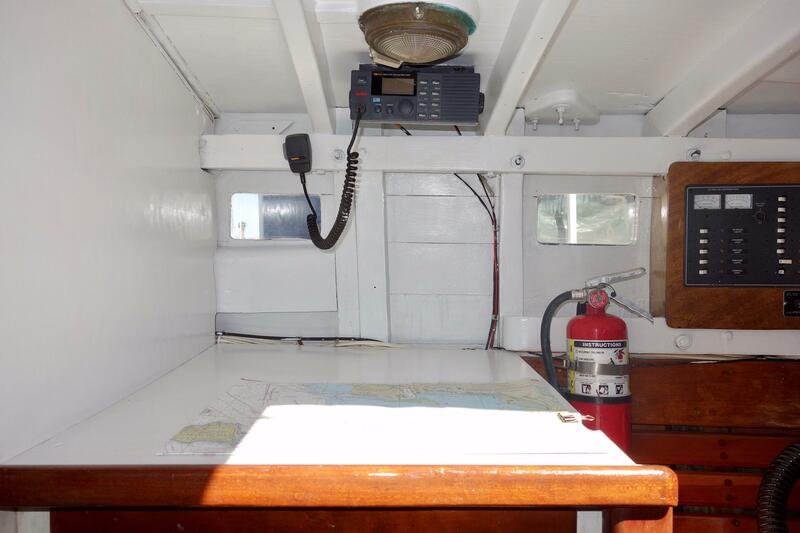 Nancy added a cockpit and wheelhouse. 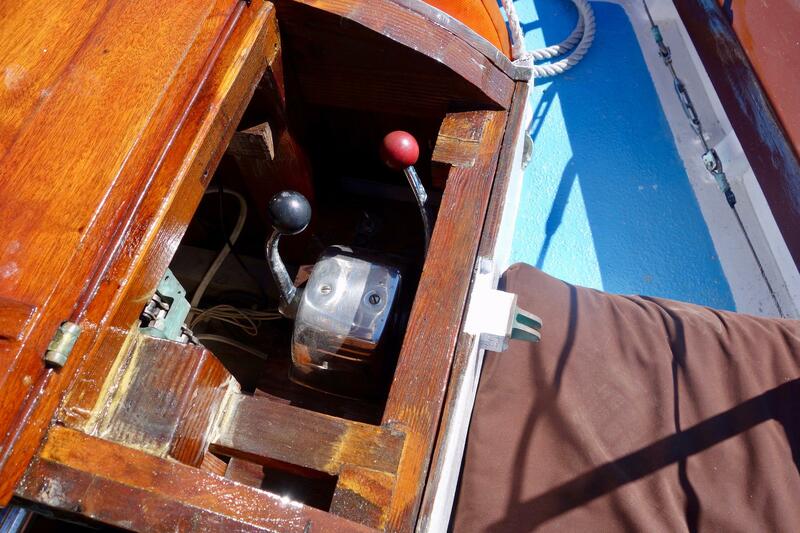 Mark engineered a custom steering system linked to a wheel to replace the original tiller system (which may still be used if desired). 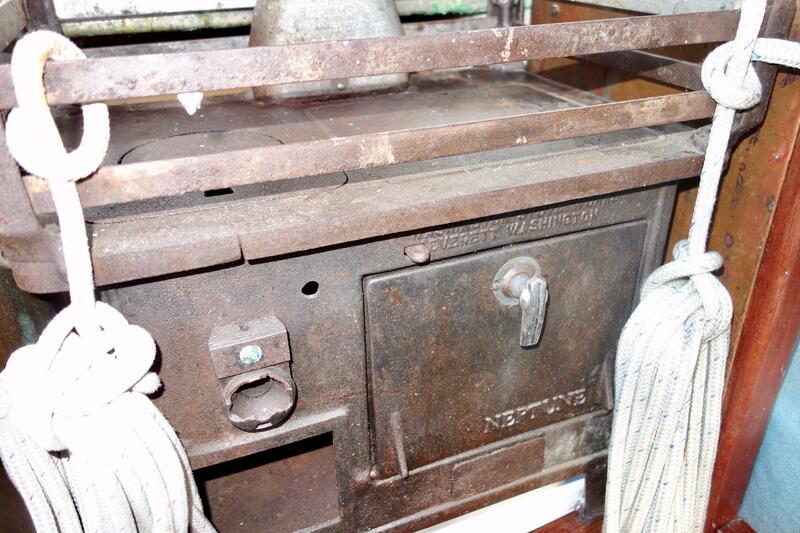 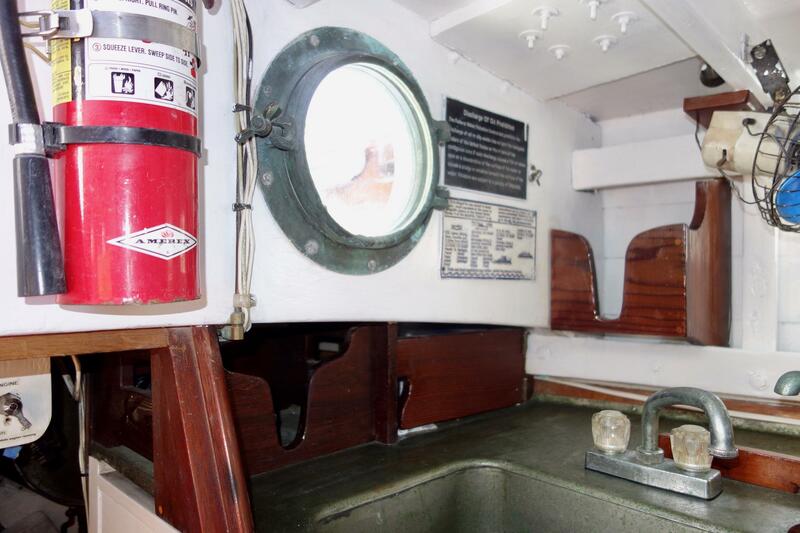 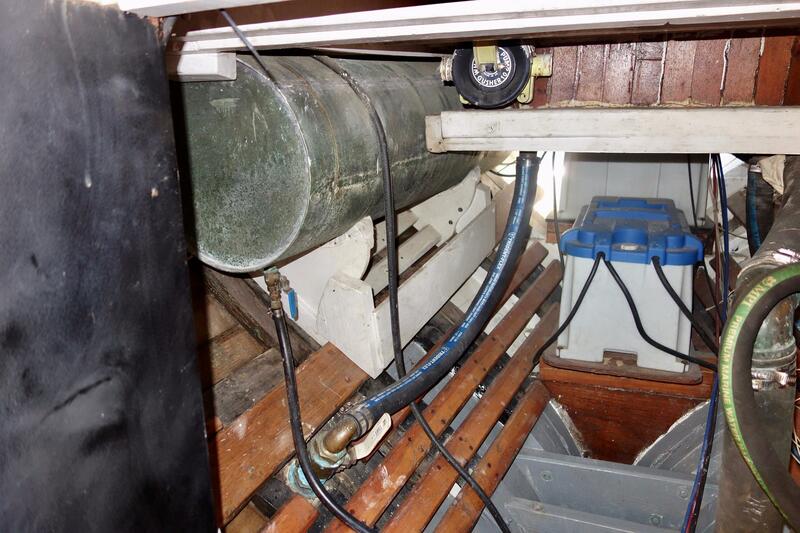 They left the Monel galley counter, fuel, and water tanks, valuing its anti corrosion qualities. They converted her foresail to a modern Marconi rig from the original four-sided sail. They updated all her systems, then cruised the schooner to Ensenda, Mexico in December, 1994. 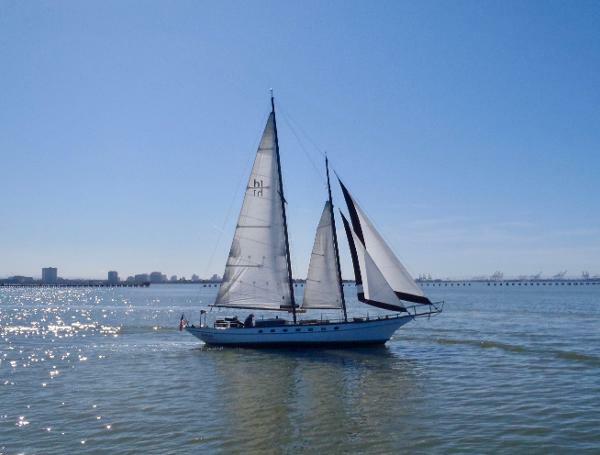 Nancy comments; â€œAs you return from southwest of Ensenada, entering Bahia Todos Santos to the south of Islas de Todos Santos, the swell concentrates and builds sharply. 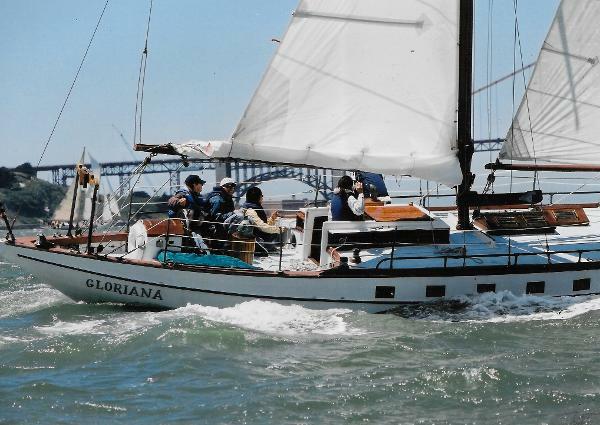 Gloriana's full keel and Herreshoff hull let me steer her safely back into the Bay despite winds over 30 knots and steep, confusing seas. 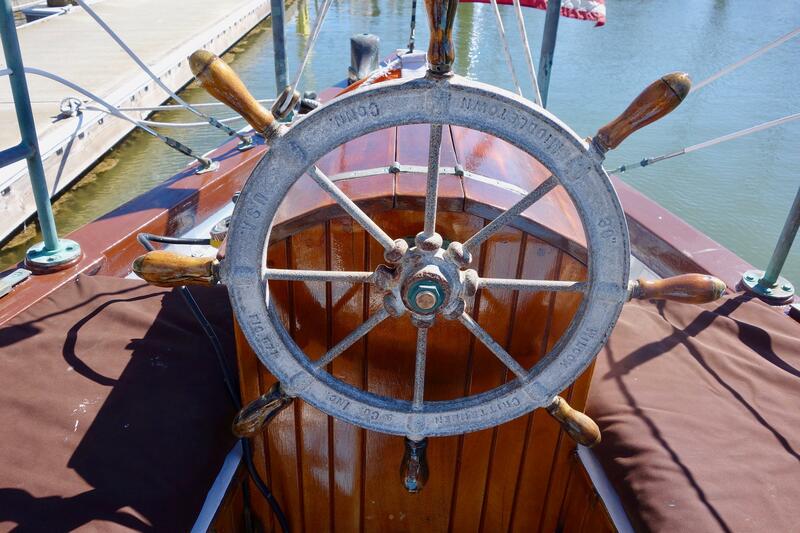 She carves through the waves, holding her courseâ€. The schooner returned to the San Francisco Bay in 1995. 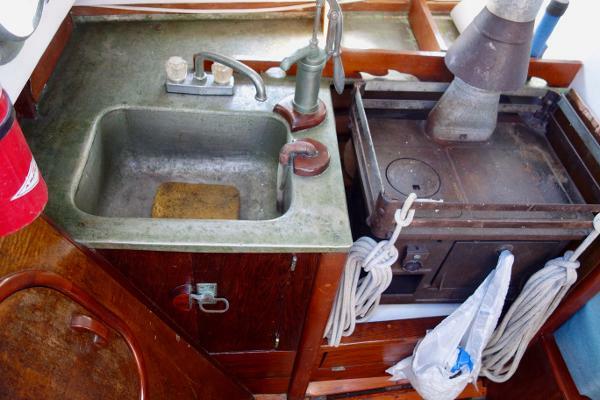 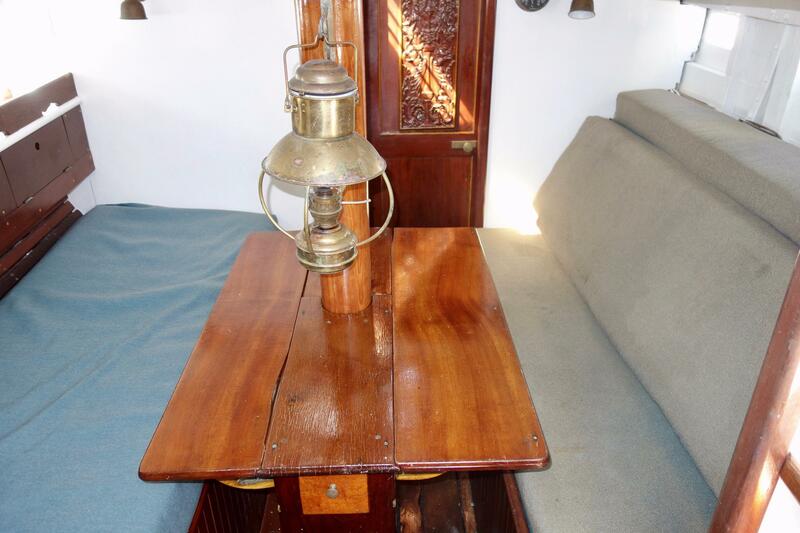 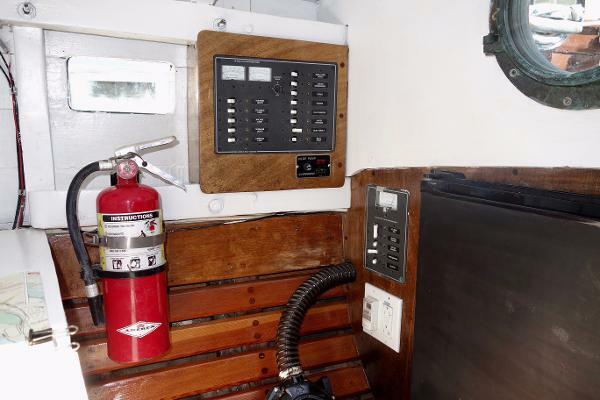 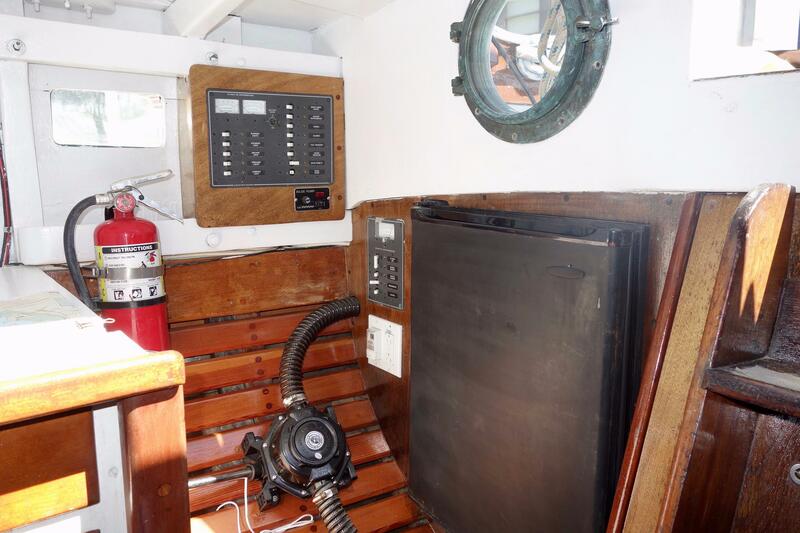 She's been turned from a cruiser into a day sailor, with the shower, the propane connection to the stove, and the Monel water tank connections to the two sinks removed. 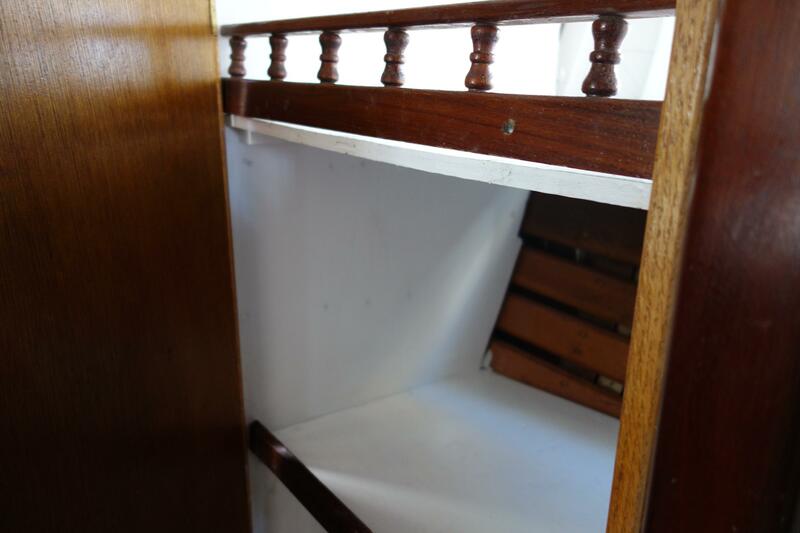 (They could be quickly re-established). 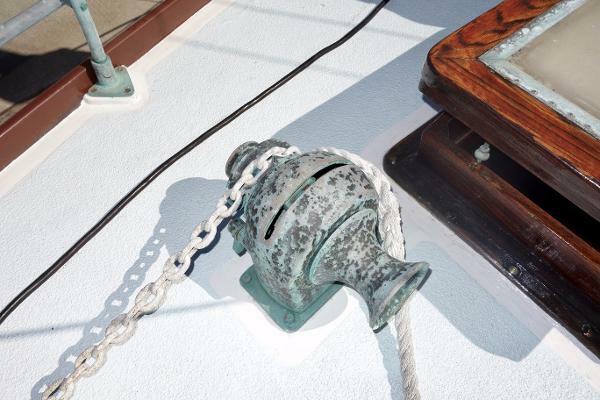 Her Wilcox Crittendon Skipper head is still in service. 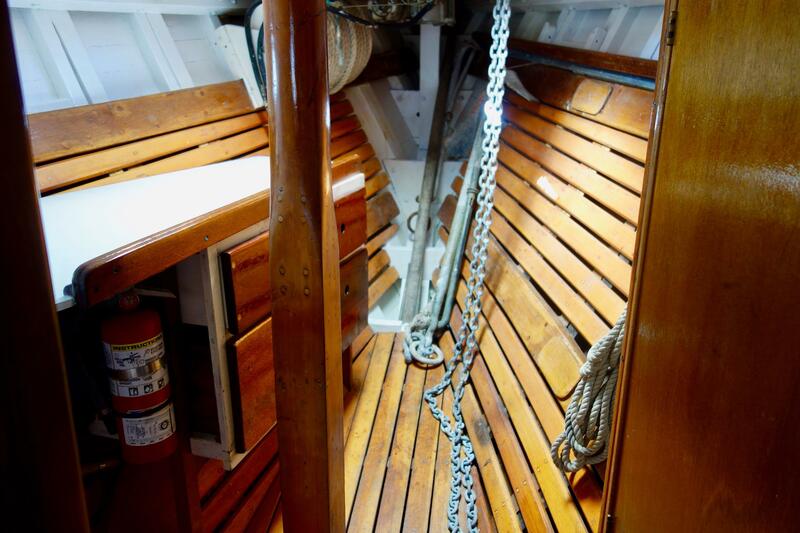 Nancy and Mark have maintained the schooner with careful attention, and haulouts and surveys every three years. Steve Hutchinson has replaced some planks over the years, with remaining planks are still sound, original Douglas fir over oak frames. Her deck and cockpit paint was recently changed to Awlgrip to minimize maintenance. 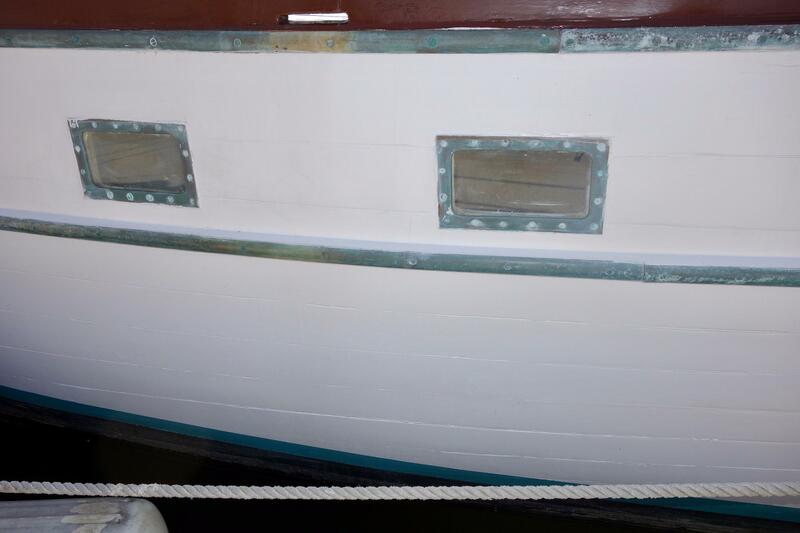 Her boom gallows, wheelhouse, cockpit strakes, cabin sides, saloon and head opening skylights, and forward escape hatch remain brightly varnished, with two part Bristol varnish. 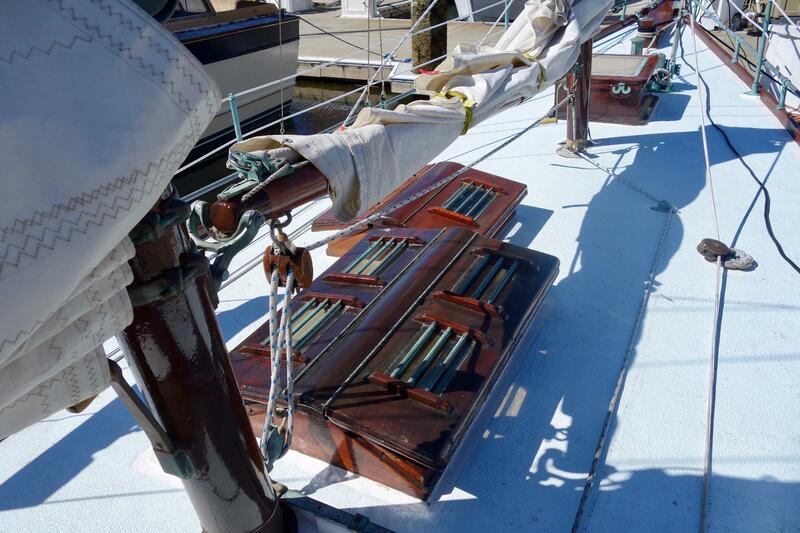 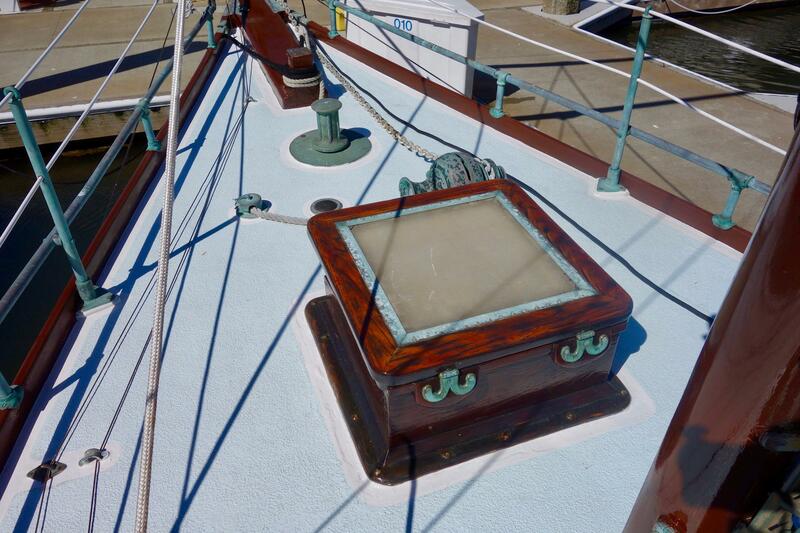 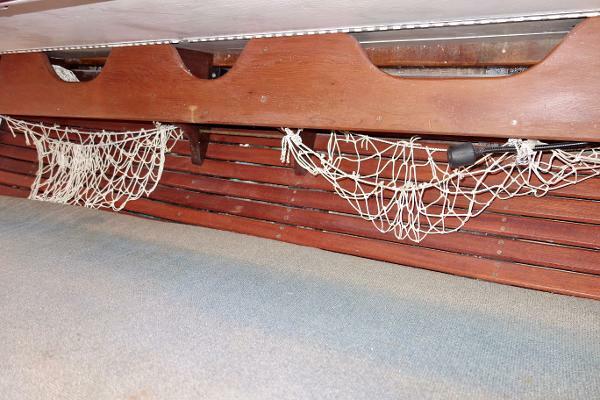 Each of these wooden features except the boom gallows has custom canvas for sun protection. 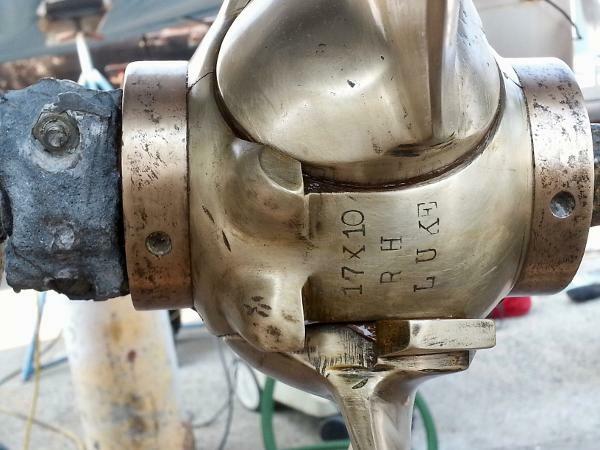 Her Borg Warner Velvet Drive transmission was rebuilt in 2016, re-installed with a new transmission heat exchanger. Mark, an electrical engineer, re-did the DC wiring in 2018 with a modern electrical panel, and battery cutouts for the house and engine batteries. 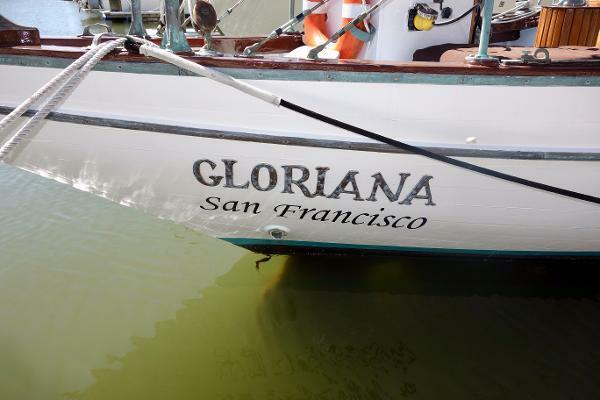 Gloriana gets sailed many times a year. 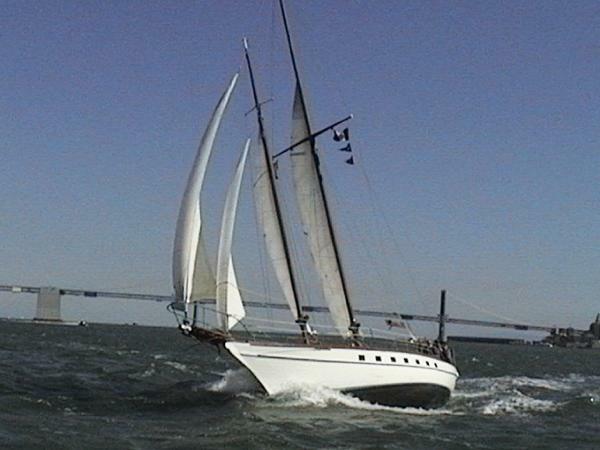 Her tall rig with full main catches light zephyrs for pleasurable winter sailing, while the complex curves of her Tancook Whaler hull tend to keep the crew dry even when beam reaching across the Slot in 25 knots, main double reefed on a summer afternoon. Crew sailing on her for the first time on San Francisco Bay are surprised by how smoothly she slices through ferry wakes and choppy seas, with minimal splash. 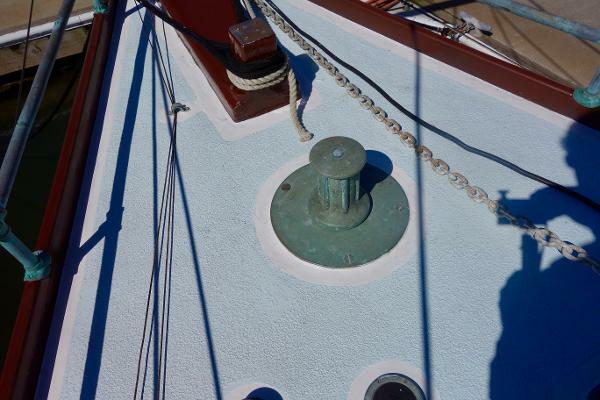 Having four sails gives the skipper many options for altering the rig to suit changing conditions. Both the jib and staysail have intrinsic luff wires, independent of the forestay. 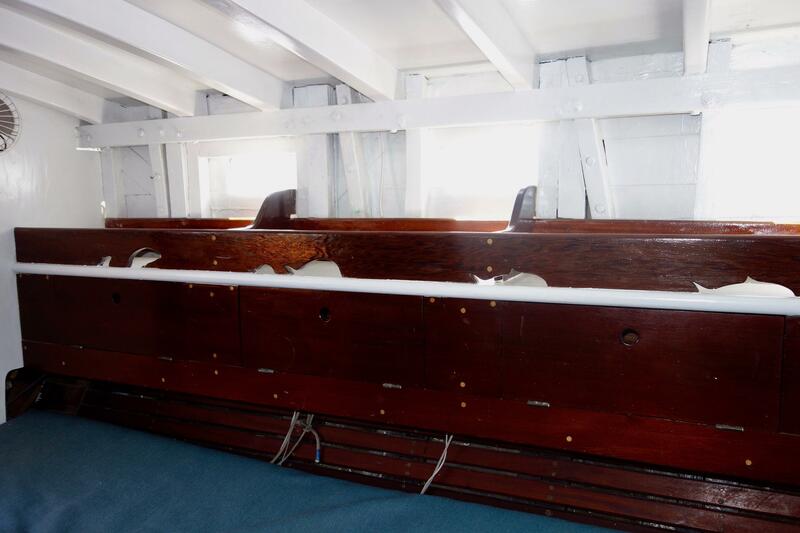 They may each get furled or unfurled independently, with lines lead aft to the cockpit. 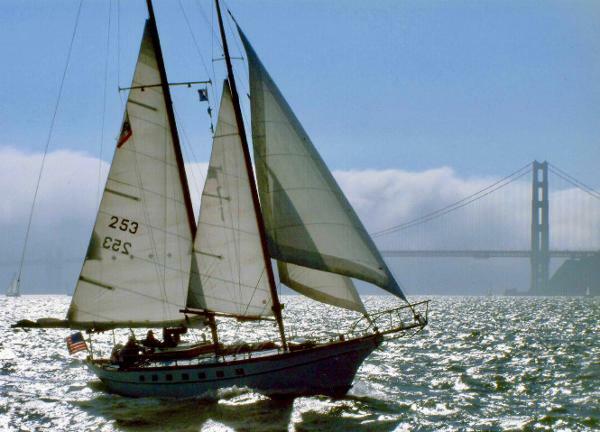 The foresail has been flown in up to 55 knot winds (with double reefed main and the staysail) as measured by the Coast Guard patrol vessel Tern in the 2005 Tall Ships Parade. Hogin Sails of Alameda just sewed new jib and staysail with sun covering for the furled edge in January 2019. 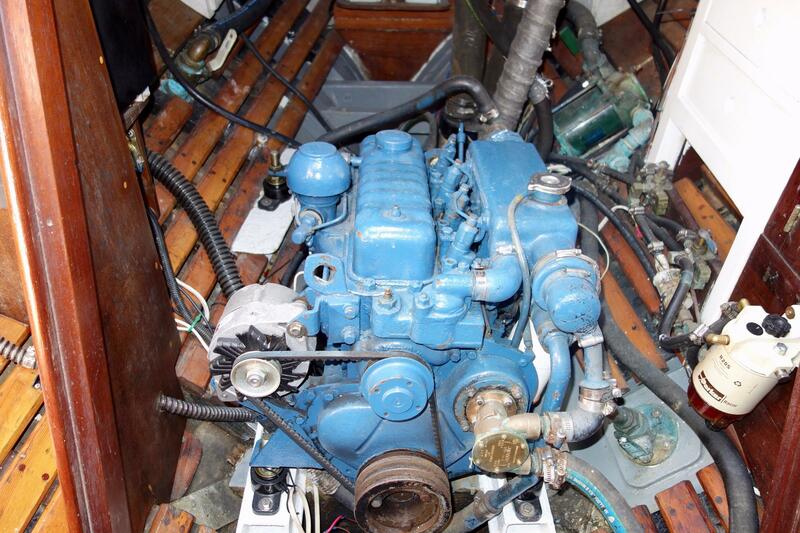 In 1987 a new Perkins Diesel M 4-108 engine was installed. The 4-108 which currently has approx. 917 hours on it is known for its reliability and long service life. 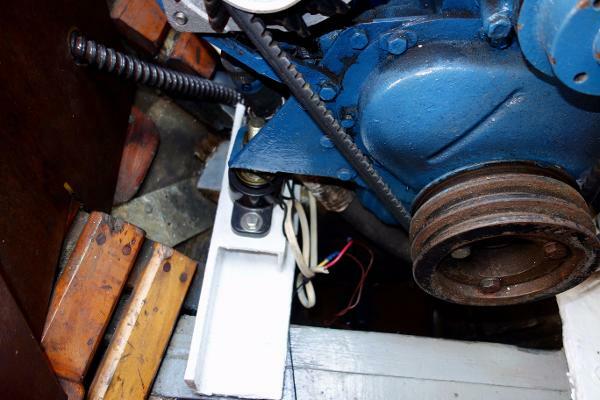 Recent upgrades include new motor mounts. The engine is connected to a Borg Warner Velvet Drive Transmission. The prop is a high efficiency P.E. 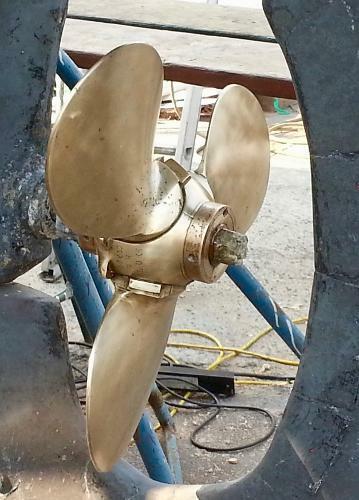 Luke Company Feathering Prop which are highly respected and hand made in Boothbay, Maine.